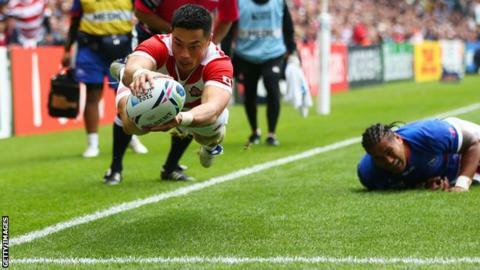 Japan boosted their hopes of reaching the Rugby World Cup quarter-finals for the first time with victory over Samoa in Milton Keynes. The Brave Blossoms, who beat South Africa in their opening match, led 20-0 at the break thanks to a penalty try, Akihito Yamada's score and Ayumu Goromaru's boot. Goromaru's two penalties extended the lead before Paul Perez's try for Samoa. But Japan held out to win a second game at a World Cup for the first time. They had lost 11 of their previous 14 meetings with Samoa, and conceded at least two tries in every World Cup match they had played in. Victory for Eddie Jones' men against the three-time quarter-finalists puts them in a great position to qualify from Pool B, with their last match against the United States - yet to earn a point - next weekend. After Japan were the first to make their mark on the scoreboard through Goromaru's penalty, the Pacific Islanders seemed to completely lose their cool and had two players sin-binned within two minutes of each other. First, Faifili Levave saw yellow for a high tackle before prop Sakaria Taulafo was sent to the bin by Craig Joubert for challenging Goromaru in the air. The two-man advantage saw the Brave Blossoms pull further away, as they were awarded a penalty try with Samoa failing to cope with a scrum before Yamada bounced off Alesana Tuilagi, spun round and finished spectacularly in the corner. Japan full-back Goromaru, on his 50th start, sandwiched a penalty between those tries before slotting twice more through the posts early in the second half to put his side 26-0 ahead. No team has ever come back from a half-time deficit of 14 points or more to win a World Cup match, but Samoa centre Perez, who had looked their most potent threat, finally got his side on the board when he went over in the corner after a fast break. But Japan were rarely threatened by the Pacific Islanders and after Samoa forward Luke Thompson's late sin bin, Jones's side were able to see out what was, in the end, a comfortable victory. Japan coach Eddie Jones: "I thought our forwards were fantastic, we shut Samoa out, and our work around the set-piece and the ruck was first class. "To be able to control the set-piece against Samoa puts you in a position to win the game. "We haven't played our best yet. We probably left two tries out there today, and that was the disappointing thing, but we've got the USA next so hopefully we will then." Samoa: Nanai-Williams; K Pisi, Perez, Leota, A Tuilagi; T Pisi, Fotuali'i; Taulafo, Avei, Johnston, Paulo, Thompson, Treviranus, Ioane, Levave. Replacements: Matu'u for Avei (55), Afatia for Taulafo (61), Perenise for Johnston (50), Lam for Ioane (47), S Tuilagi for Treviranus (69), Afemai for Fotuali'i (73), Lee-Lo for A Tuilagi (47). Japan: Goromaru; Yamada, Sau, Tatekawa, Matsushima; K Ono, Tanaka; Inagaki, Horie, Hatakeyama, Thompson, H Ono, Leitch, Broadhurst, Holani. Replacements: Kizu for Sau (71), Yamashita for Hatakeyama (64), Ives for H Ono (40), Mafi for Holani (59), Tui for Broadhurst (64), Hiwasa for Tanaka (71), Hesketh for Yamada (55).